Greek mythology introduced us to the Chimera. 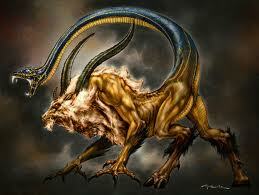 A hermaphrodite creature that was part snake, part goat and part lion. Ooh, and it could breathe fire! And this is just one of the many hybrid wonders from the greco-roman tradition. Sounds positively mythological, doesn’t it? Well not to Darwinists. The grand tale of evolutionary history requires that all modern creatures bleed into one single ancestor. Which means that if we hit the “reverse” button on natural history, we should see countless creatures that were “half this” and “half that.” Making it not just likely, but mandatory that monsters from Greek imagination be the norm. Darwinian fossil hunters are never more excited than when they appear to uncover a creature that seems to bridge two species. The famed coelacanth was one such example. Before actually finding a live one in 1938, we only had fossils of them. It is a fish with the ability to breathe air (i.e. : lungfish) for short periods and it is a tetrapod (i.e. : has four primitive limbs). So, naturally, it’s fossilized version sparked massive curiosity and excitement from the evolutionary biology crowd. It seemed to bridge the gap nicely between land creatures and fish. However, once it was found by fisherman off the coast of South Africa, it was rushed to the lab and dissected. To the disappointment of scientists it displayed zero evolutionary change compared to its 65 million year old fossilized cousins. Furthermore, its physiology was no different than other modern lungfish. In short, it was not — despite it’s four limbs — a creature in transition from fish to land dweller. It appears we have a failed attempt at finding our Darwinian mythological creature. Rats! But the point is that despite the lack of evidence in the fossil record, the story of Darwinism does spur evolutionists to look for the most incredulous and unlikely concoctions in the natural realm. Bizarre creatures that would otherwise only appear in mythology. It also spurs them to look away from the fact that the fossil record delivers ready-made classes of animals, rather suddenly and with no slow bleed from one category to another. But Darwinism is the new collective faith and its adherents don’t seriously entertain its errors. Rather, they continuously seek for evidence of chimeras the way some catholics look for the appearance of the Virgin Mary in their food. And much like the ancient Greeks’ pessimistic outlook on human destiny, the Darwinian mythology paints a grim, purposeless portrait o f the human’s meaningless dance on the cosmic dust speck of Earth. Pain and misery follow most people for much of their lives and then we all bite the dust. The gods are feckless and uncaring. A smooth unfeeling physical reality is forever deaf to the pleas of humans. Next DO DEMONS & ANGELS EXIST? Pingback: Natural Selection: What Is It? Does It Have Limits?